Ray tracing is a completely different way to render 3D graphics in games. It recreates reality by tracing individual rays of light coming from the ‘camera’ (or in the case of gaming; the player’s point of view) and simulating how each individual ray of light interacts with different ingame objects. This means that each ray of light can be blocked (creating shadows), reflect off of different surfaces, interact with other light sources, and so on. This form of dynamic lighting is a tremendous leap forward in making games look more realistic, as previously games have used a more static and ‘baked in’ form of lighting which never really looked completely realistic as (however advanced the technology might be) the light and the various interactions with the environment weren’t rendered dynamically and in real time. While ray tracing as a technique has been around for a while it has mostly been used for rendering static images or CGI for movies or TV shows, since ray tracing has historically been a very intensive process which took multiple hours or even days to render, making it completely unpractical for real time applications such as gaming. Recently Nvidia unveiled their new RTX line of GPUs which, aside from ‘just’ being able to perform better than their predecessors, also feature the ability to do real time ray tracing, something which was previously simply not achievable in real time applications. Nvidia released a bunch of videos to showcase this new technology, and one of the most impressive displays of real time ray tracing technology can be found in the Battlefield V video. 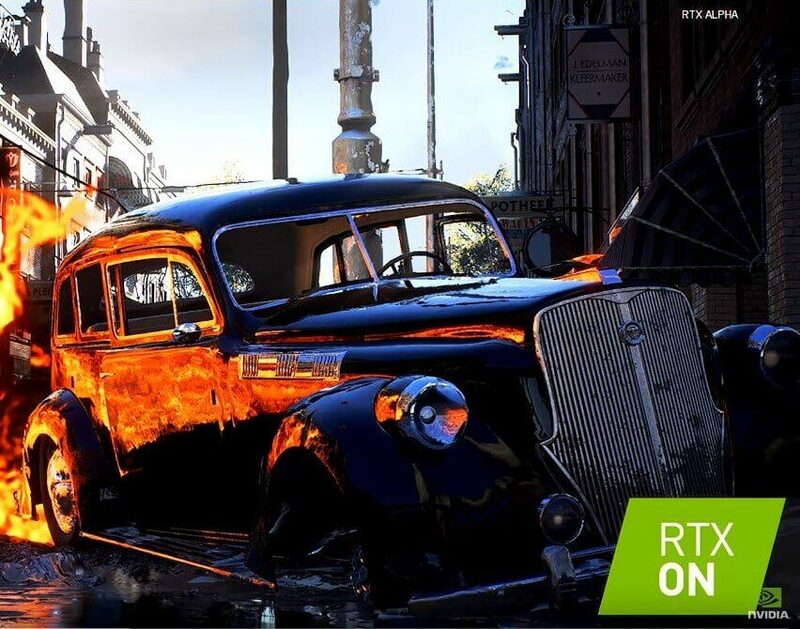 On the image to the right you can see how ray tracing manages to create a realistic reflection of the flames on the black car and how the flames faintly reflect on the wet pavement, among other things. We do encourage you to see for yourself so if you want to you can click here to go to the timestamp in the official video where they show this off in motion. In short: ray tracing provides a much more realistic and organic image when gaming and it could very well be the next big leap when it comes to graphics in computer games, making games much more immersive by offering near-lifelike behavior of light. 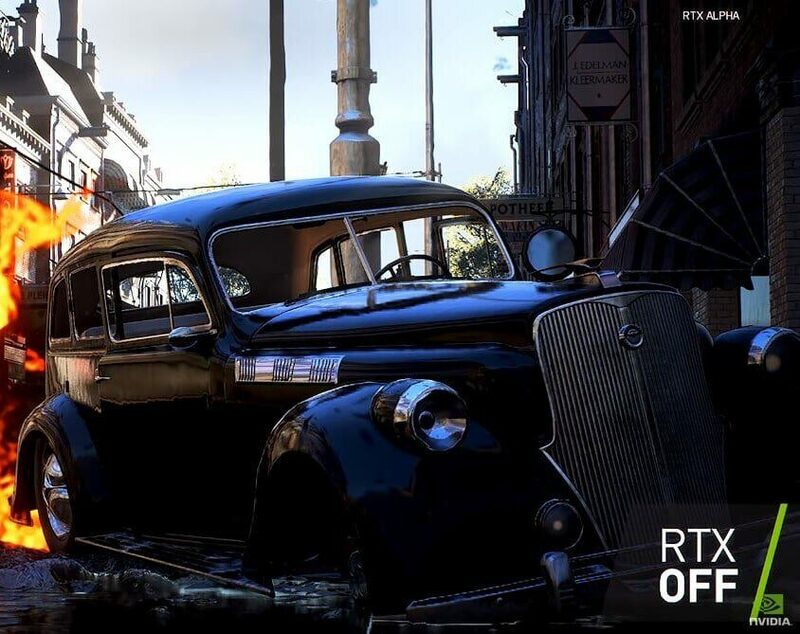 As of now ray tracing in gaming is obviously still in its infancy, so the only cards that will be able to perform this kind of magic are Nvidia’s RTX 2080Ti, RTX 2080, and the RTX 2070 and only a few games will support ray tracing at launch, including Battlefield V, Hitman 2, Metro Exodus, and Shadow of the Tomb Raider. A full list of games supporting ray tracing at launch can be found here. Ray tracing in gaming is in its infancy right now and the RTX line has only just been announced. Being a new technology means that there will be a certain premium attached to adopting it early and it also means that the technology isn’t flawless yet. We don’t know how the performance of games featuring ray tracing will be as of now, for example. Companies and developers will eventually get better when it comes to implementing and optimizing this technology though, so let’s look ahead and see what competitive advantages or changes the release of the new RTX cards might give us gamers in the long run. Aside from increased performance (you can never have enough FPS) and offering a much more immersive experience we’ll be able to see shadows in a much more realistic and clear fashion. This could mean that we’ll not only be able to spot enemies around corners (which is something that is already possible today, to be fair) but that we’ll also be able to see what exactly they are doing around said corner. This could help you secure frags when you see an enemy with a grenade in their hands, for example. 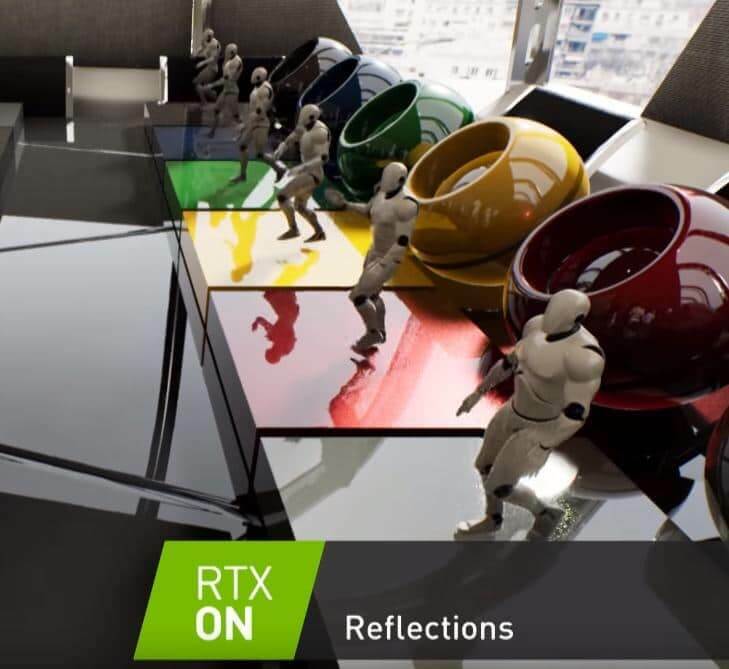 RTX might also change the competitive landscape by offering realistic and real time reflections. Today the only truly reflective (sort of) surfaces in most games are mirrors, but when ray tracing becomes a mainstay in gaming we’ll be able to spot enemies crawling around outside by seeing their reflection in a shiny car, for example.